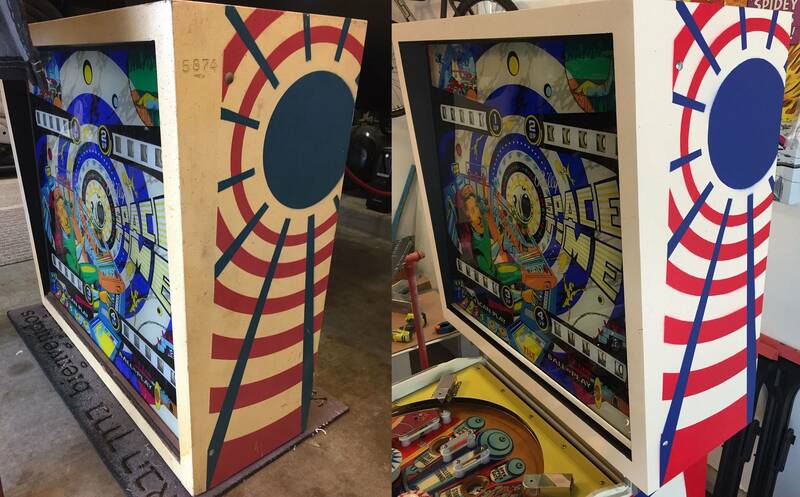 [EDIT 03-10] I first asked here if I should or shouldn't restore this Bally Space Time: https://goo.gl/photos/Y5sZK81VeexuTaF88 considering the fact that I never had an EM. First steps few posts below. manples last edited this post 11 months ago. personally I would get new rubbers (including shooter tip) , new ball and get it running to play. I have gotten them in worse shape and make 'em play, it's all part of the fun for me. Ok I will order that and we'll see ! Game looks complete and no really obvious hacks or damage. It's a great, fun game when up and running. 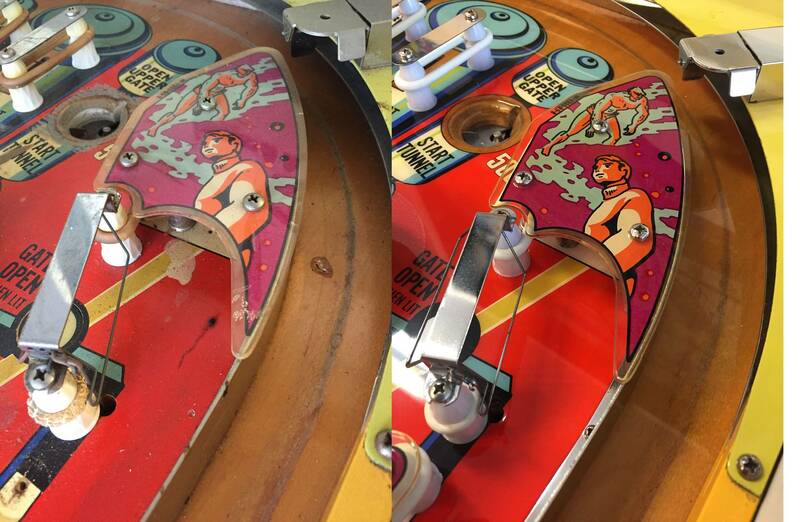 Some playfield wear, but not really all that bad. If you do make a mistake and make something worse instead of better, it's not the end of the world. Absolutely get this baby up and playing. Have some fun with it! Fuse holder and fuses ordered ! Thanks Bribo13 ! 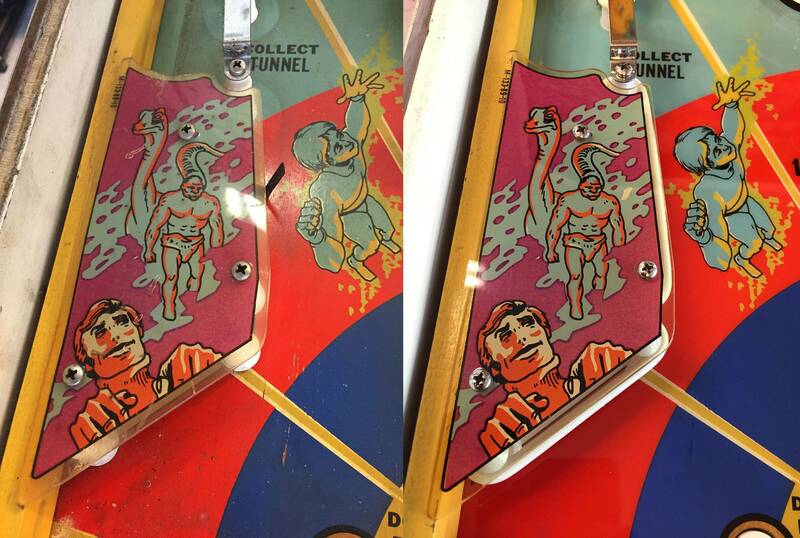 As a pinball virgin I'm still scared by some stuff like the salvaged coin door wires but I'll figure this out with the schematics/manual. 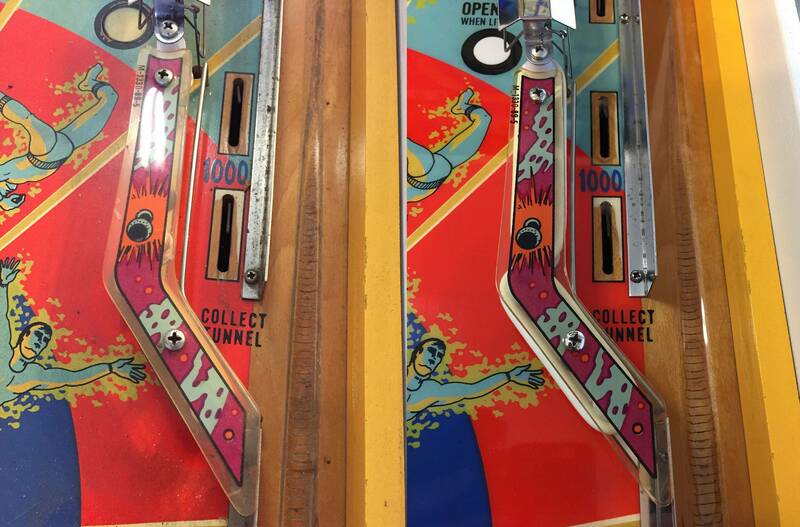 Word of advice: If the coin door isn't wired up properly, the game won't even attempt to start. 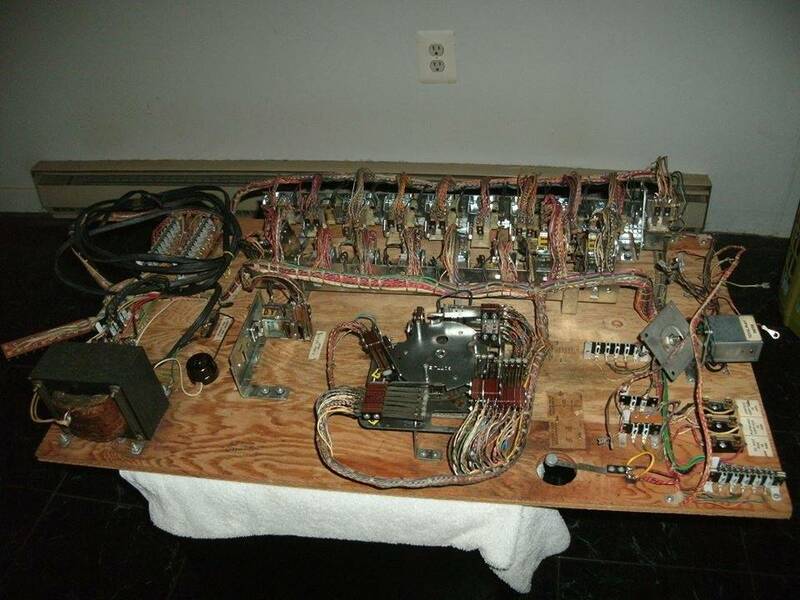 My Captain Fantastic had ALL of the wires pulled out--it was a mess--but the game wouldn't do a thing until I got schematics and rewired it. 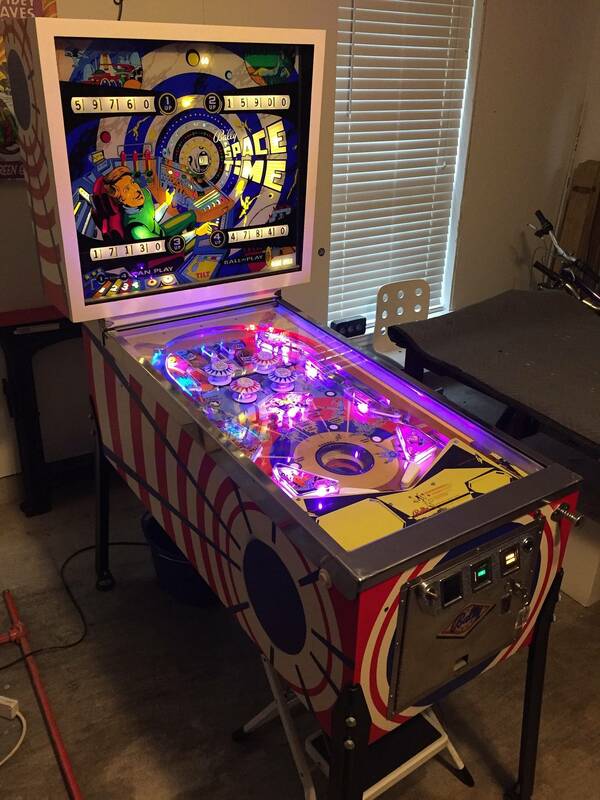 Manples, I just sold my Space Time - its a great machine. Yours looks in good shape. One more thing I remember with mine was that I had to completely disassemble the motor that drives the time tunnel. At first I thought I could get away with a cursory clean, but that thing has to run super smooth to avoid blown fuses. Once I gave it the cleaning it deserved, it ran beautifully. I got it printed at Staples for $6. 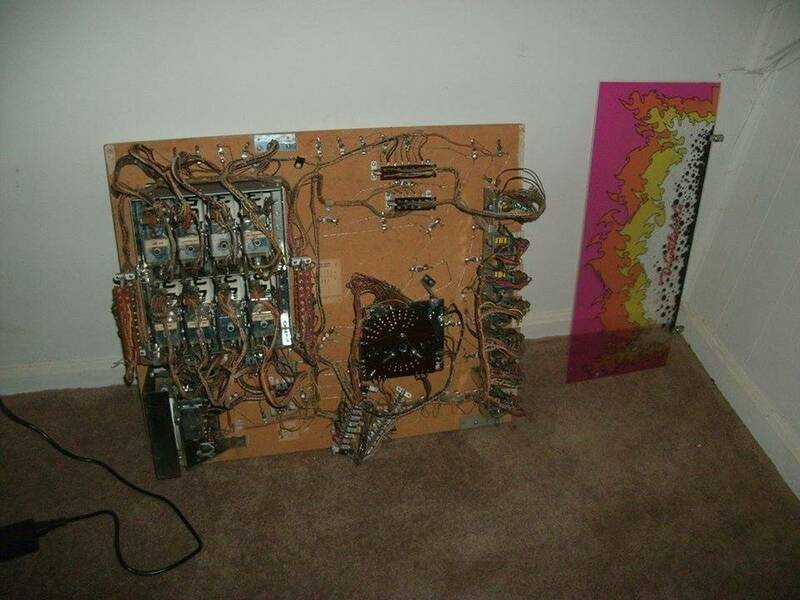 what size was the schematics ? or rather how big can you get ? 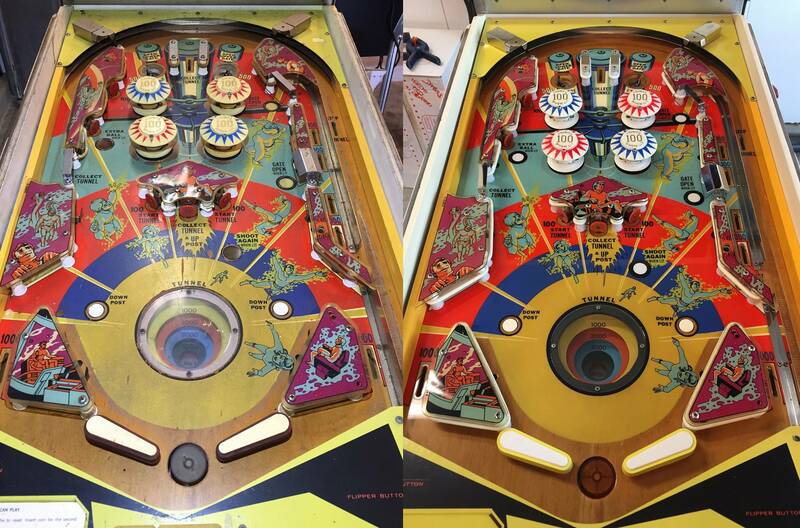 I had one of these I lucked into for 25 bucks when I first got into pinball collecting. About the same shape as yours. I got it running and man it was a blast. I sold it for 200 dollars later and I always regretted it. As far as EMs go Id rank it up near the top, IMO. Fix it up and play it! Fixing it up is half the fun! I bet you have it running in a month or two. They printed it on 48 x 24 paper, its about 44 x 12 when printed - so folder longways it looks pretty much like an original. Ok. 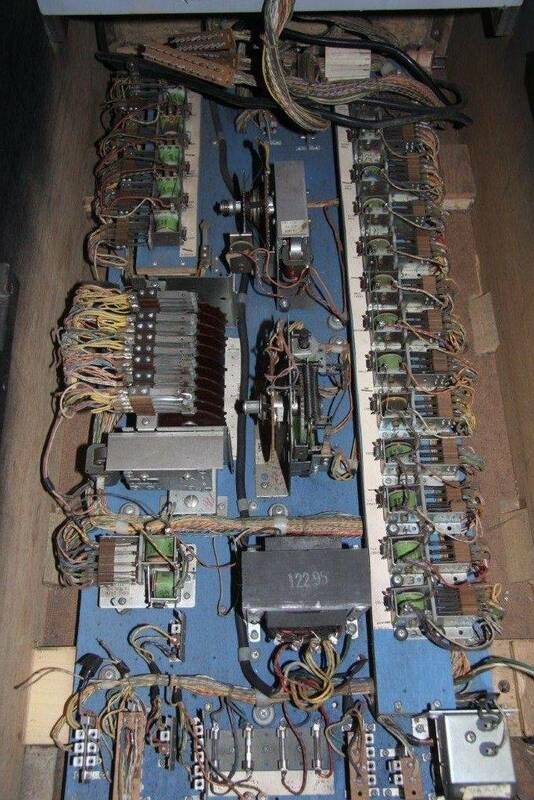 I've found the schematics so I'll rewire this coin door properly. Not sure how to set it in free play though. Maybe it's in the manual. 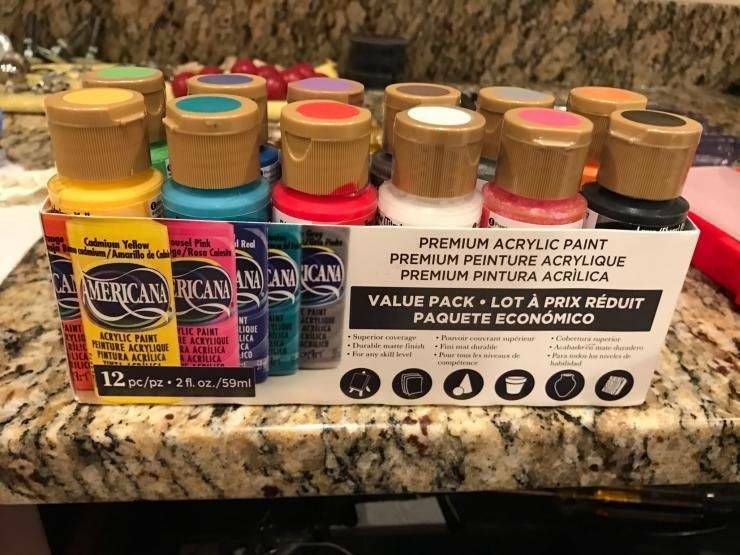 [...] this set of cheap paints from Michael's has colors that matched pretty close to the machine [...] One more thing I remember with mine was that I had to completely disassemble the motor that drives the time tunnel. At first I thought I could get away with a cursory clean, but that thing has to run super smooth to avoid blown fuses. Once I gave it the cleaning it deserved, it ran beautifully. So I started by removing the panel that holds everything inside the cabinet and cleaned the dust with an air compressor. Then I visually inspected everything (switches, cables, etc.) and found nothing too bad so far except 3 relays that are pretty brown. I've bought the schematics where I can read the Ohms value for each type of relay, so I've verified all of them with a digital MM: all good ! even the brown ones. I have a problem though. 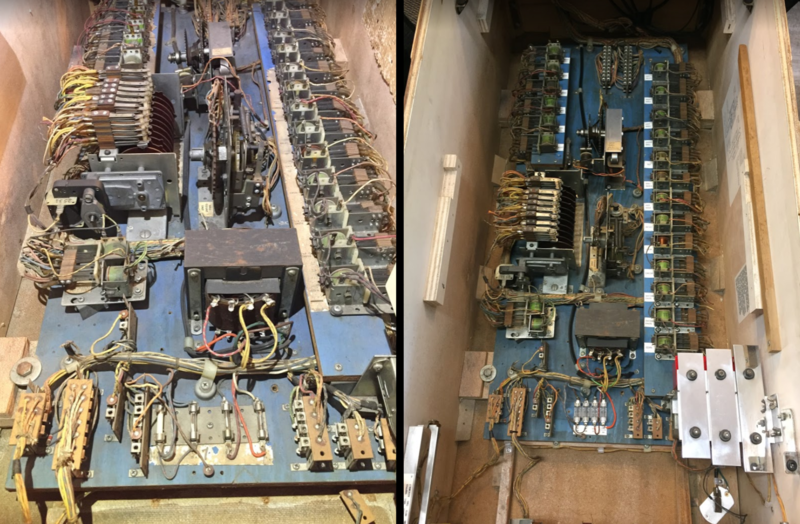 Some labels in front of the relays are missing (maybe eaten by a mouse?). 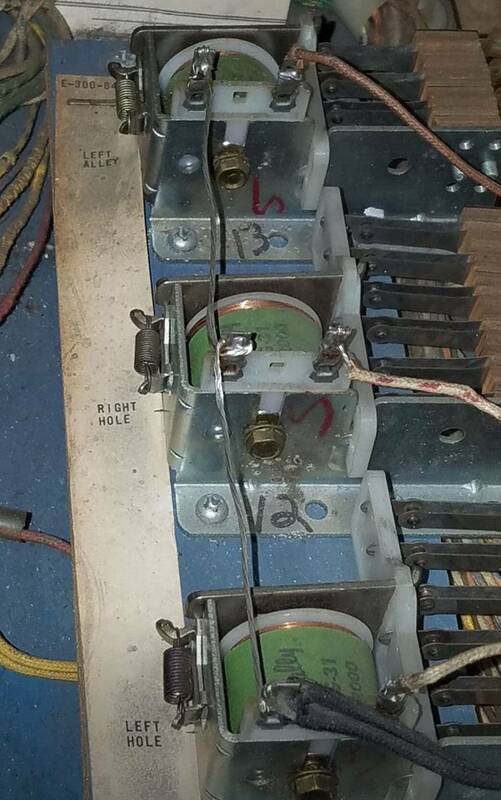 The last 3 on the top are G-31-2000 relay (49 ohms), I don't know what they are related to. 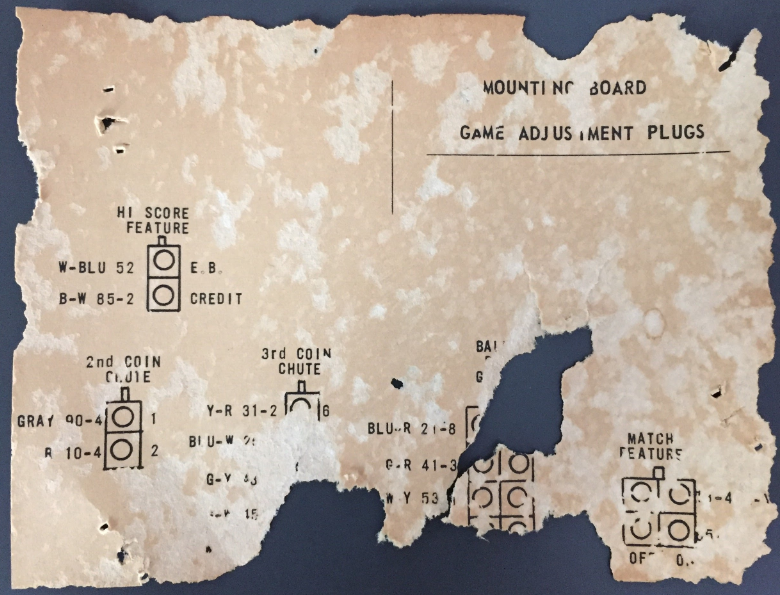 Maybe 10, 100, 1000 point from a decipher attempt of the schematics... 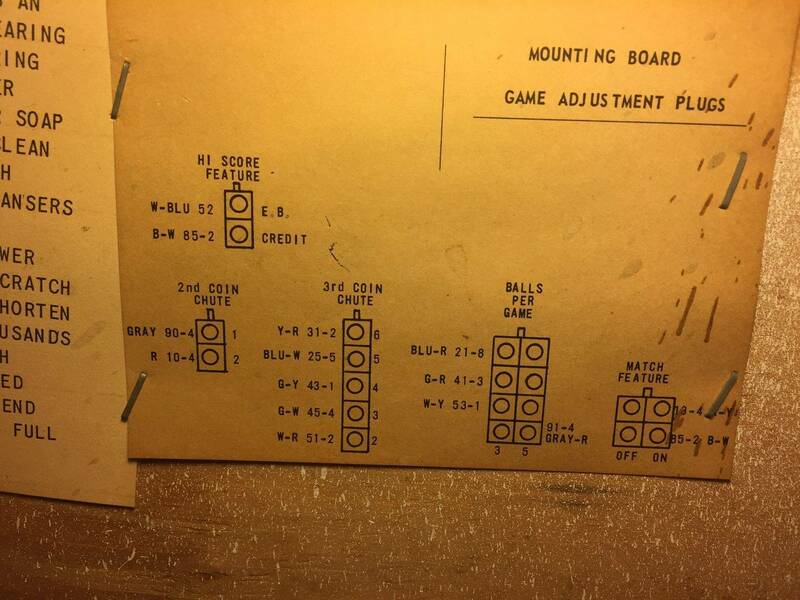 The 4th is very probably the Extra Ball as is the only one G-32-2500 (78 ohms) left on the schematics. ...maybe that'll help, too. Good luck! Since another newbie recently got shocked I'll bring it up: Remember your 110V line voltage fuse is always electrified when the game is plugged in regardless if the master cabinet switch is on or off, I could see how that is easy to overlook down the line. Unplug the game when messing with certain things, the schematic will let you know where that section of always-on high voltage (not a great mix, huh...) is. Thanks Ryan, I favorited your post, very impressive and instructive! 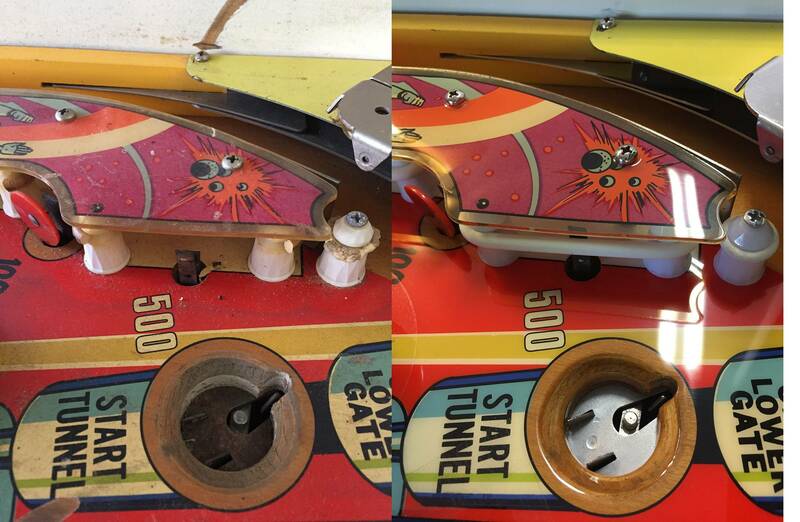 I got some help on Facebook from Nick Destefano who kindly took a picture of his Time Zone, so the missing labels are Left Alley, Right Hole, Left Hole. I can move forward. Glad someone snapped that pic for ya. Keep at it. ...slow and steady, as they say. 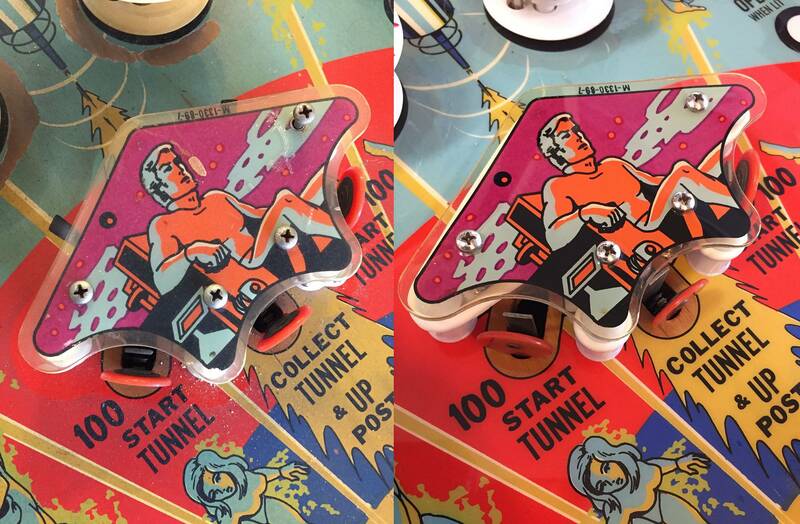 Is there a Space Time owner nice enough to take a picture of his Game Adjustment Plugs please ? 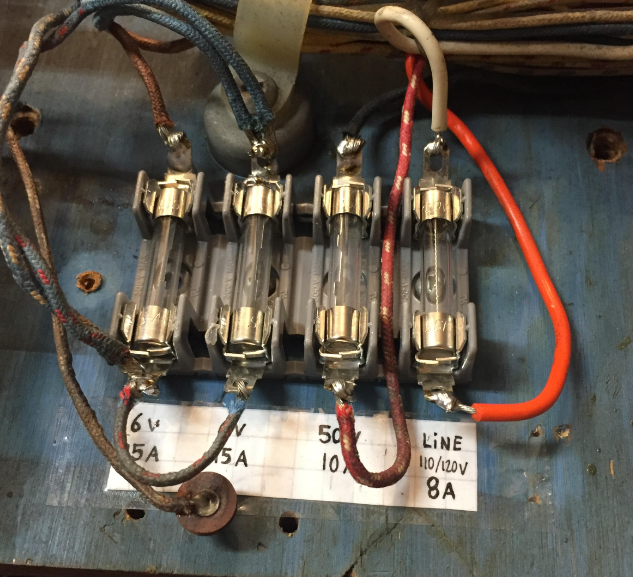 It should be located inside the cabinet, right side, next to the transformer wiring diagram. 4Max passed this post on to me (he was the prior owner of my Space Time) -- and yes, as soon as I get home tonight, I'll take a picture of the label and send it off to you. 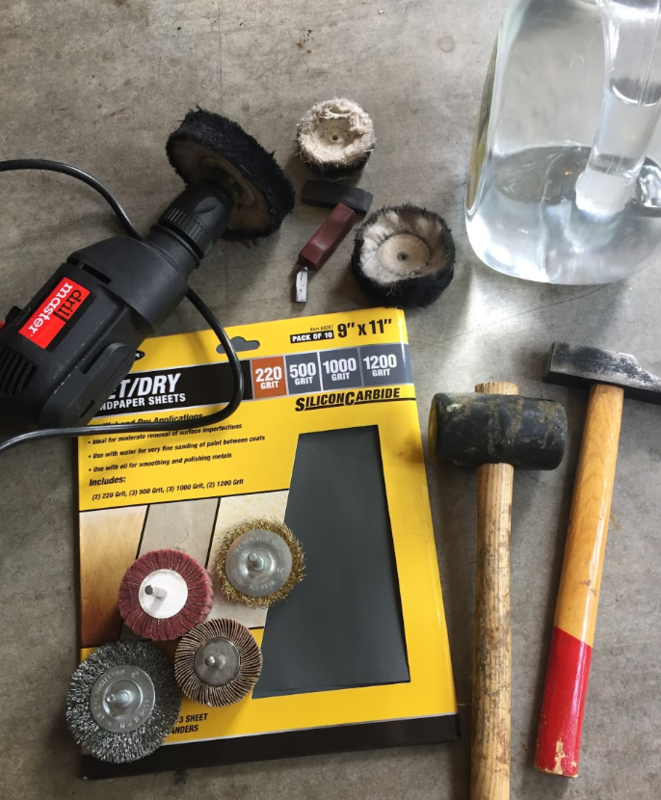 Whatever you do don't use a flexstone to clean points, use a metal file or fiberglass pen to varnish them otherwise you will have to go back and clean them twice to remove all the non conductive silicate dust. You can use wd-40 to clean the brown steppers and it kinda lubes them a bit, spray on a rag. oh and bypass any slam tilts that are always closed!!! on a side note it's incredible how Novus 2 can clean the score reel, in 5 seconds it's all white and shiny. Still have to clean Player 1 reels, they are super dirty... I'll post some pictures soon. Few pictures of the progress. The cabinet was cleaned inside and outside. I've tried to remove all the dust that I could but it's sticky. 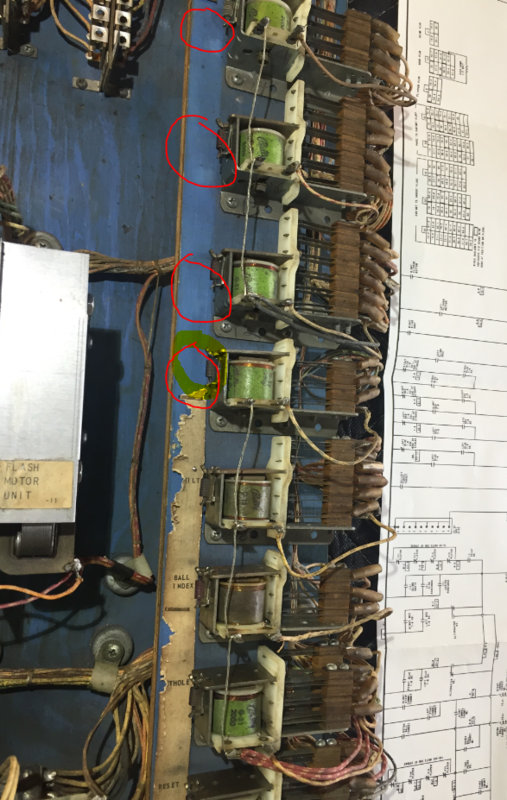 I've visually inspected all switches and was able to find 2 that needed adjustment. I mean I hope they were stuck in a closed position while obviously they had to be open with the motion, just like their close-by twins. Certainly true on SS machines, Gmkalos, but flexstone should be good for EM low voltage points (all except flipper buttons, EOS flipper coils, where metal file is required). Anyway more to the point, before others ask, Manples how did you get that coin door looking so amazing?! + a Standard Coin Door Decal from PBR (BLY-M1895 $4.50) and a new lock. Okay - I hope this is clear enough for you. If not, I'll certainly try for another angle....Let me know if there anything else I can get you. That's perfect JDonovan, thank you so much ! 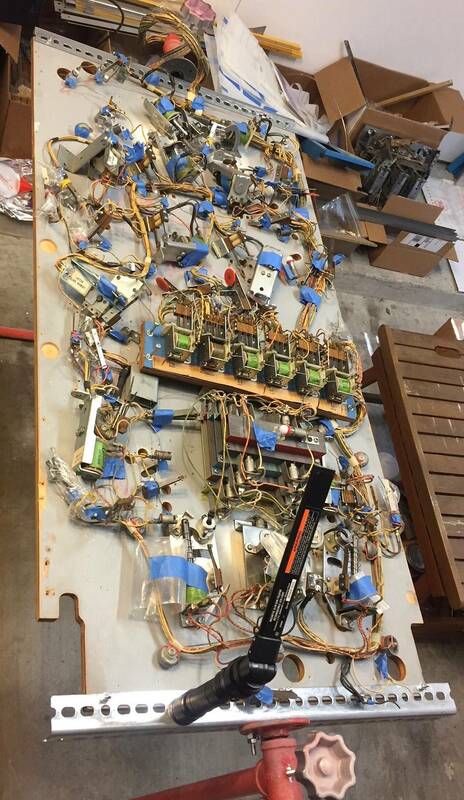 Stepper units are clean, switches are clean and adjusted, everything looks fine: cabinet, backbox, playfield. Power ON then left flipper = GI illuminates, no flaws. Reset sequence runs perfectly, all reels go down to 0 and score motor stops. ... as soon as I hit a 10 point target (or a bumper)... the 10 points relay gets stuck an the 10 points score reel goes "buzzzzzzzz"... and I have to turn the machine off. Any idea of what happens there ? Of course I've been following the bible here http://www.pinrepair.com/em/index2.htm#stuck but my problem doesn't occur when I start a game, it's works until I use the 10 point. Does this happen in just player one, or all players? I've just checked and it doesn't happen with Player 2. The 10 point relay works well with Player 2. But... when I hit a bumper skirt the 100 relay gets stuck. Weird. So I have different symptoms between Player 1 and Player 2. I will do more tests with 3 and 4 and will post detailed results. Awesome job following the pinrepair guides, taking your time, and lubricating with a non flamable and non conductive lube like that teflon gel!! Your progress looks great! It sounds like a couple of your score reels may be hanging up still? Do you know whats buzzing? 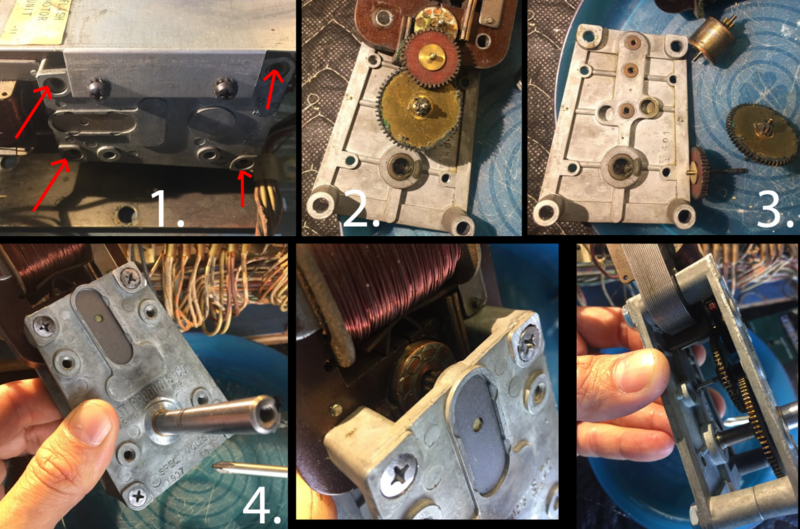 Like if you hit 10 points and the 10 point score reel starts buzzing, can you help help the reel along a little gently to rotate and then see if it rotates and stops buzzing? If so, maybe still something gunked up a little, or maybe a weak spring or coil? If it was totally taken apart at every point, cleaned, and lubed....then I would think springs. Ohh, double check any of the contact points and point gaps of course. 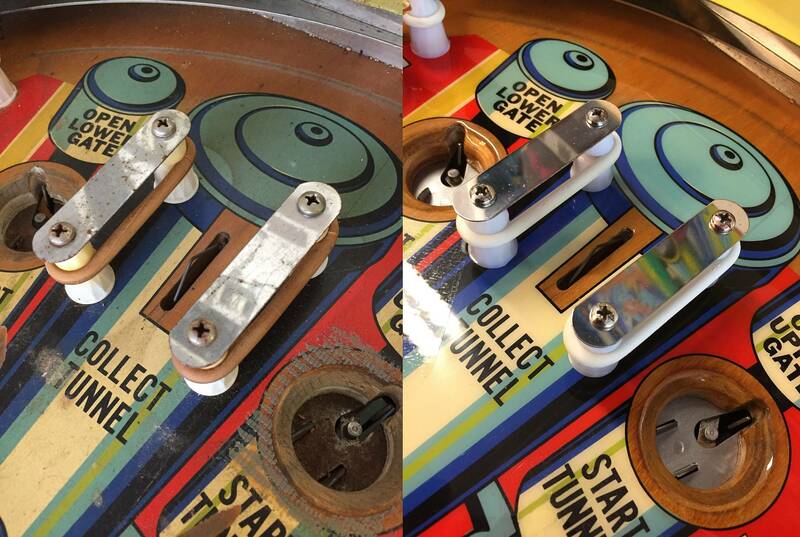 Actually every score reel was taken apart, cleaned and the spring strengthened. So when I manually activate the plunger, the wheel advance freely in a clear motion. So maybe I should recheck the gaps between the switches. For sure I can't move the reel when the 10 points relay is stuck. The reel's coil blocks the plunger. And the biggest buzz comes from the 10 points relay. - Power ON : OK. Just the transfo buzzing (little bit to loud IMO). Score motor doesn't move. So let's forget Player 2 for the moment and run some tests with just Player 1 (had to turn the machine OFF, move the Player 2 1000 points reel to 0 and restart the machine). * there are 4 bumpers, they seem to work 2-by-2 (I suppose, from from the lights). One more thing... one of the bumpers pair have a intermittent synchronized blinking. I'll do more thinking, but one thing real quick about pop bumpers.. Pop bumpers with synchronized blinking may be a blinking bulb installed (forget number for blinking bulb)...regular bulbs are 44 or the lower power bulb 47 for less heat. Sorry it's not a blinking it's more like a flickering. They are 44 bulbs and they flicker at the exact same time and frequency. Man I will check that once I get back home, you're probably 100% right, if the bumper is lit it's supposed to score 100 (which works) and not 10.
the P2-1000pt reel , my guess would be the corresponding leaf switch on one of the reset relays. Pacmanretro is right. 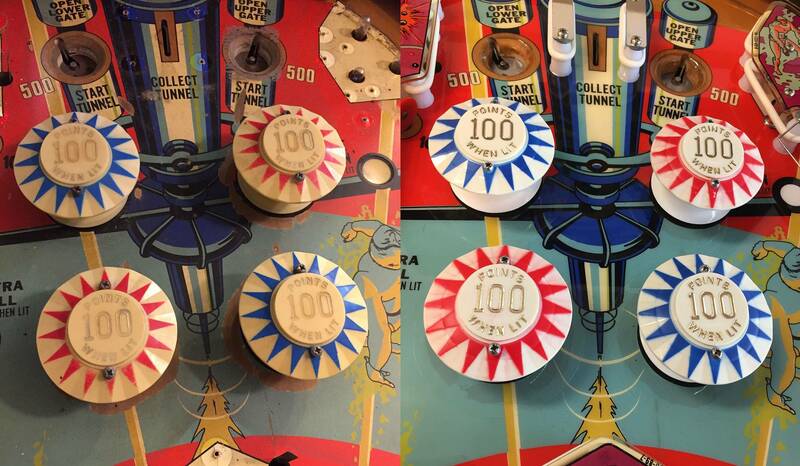 The lit bumpers are working because they score 100... The non-lit bumpers score 10 so with them I got a stuck 10 points relay, just like the other 10 points switches on the PF do. So my problem for P1 is limited to the 10 points. chas10e Thanks. I've just tried to clean and adjust the EOS, same problem. I'm now trying to understand what you meant with the continuity test I have a digital MM with sound continuity. Can you be more precise on what I should do to troubleshoot this EOS? Big thanks. Not sure off hand, but maybe a bad connection to one of them. Either at power wire by bulb base. 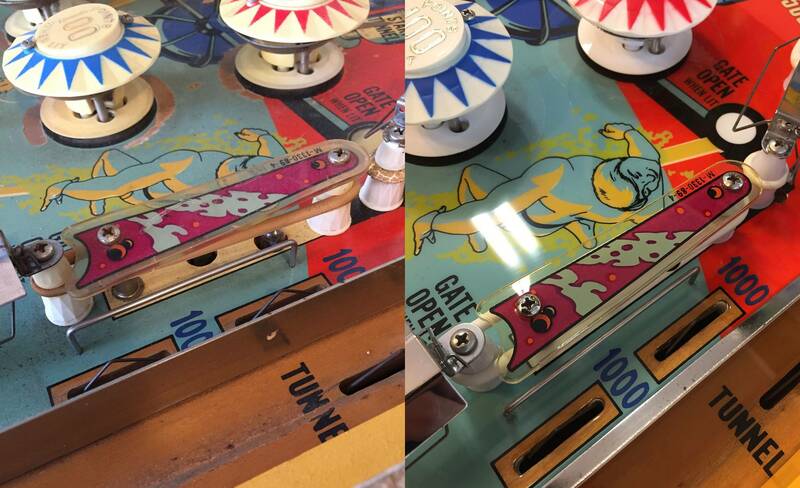 Or, possibly a dirty/worn/broken bad connection on plug(s) to playfield? Make sure all the male and female pins are clean on the main plugs and that non are real loose or have broken tabs on the female half (I forget off hand how bally has these set up). the score reel tries to turn but can't ? - Power ON, Start, everything is fine until I hit a 10 point switch or a 10 point bumper. NOTE that it only concerns P1. 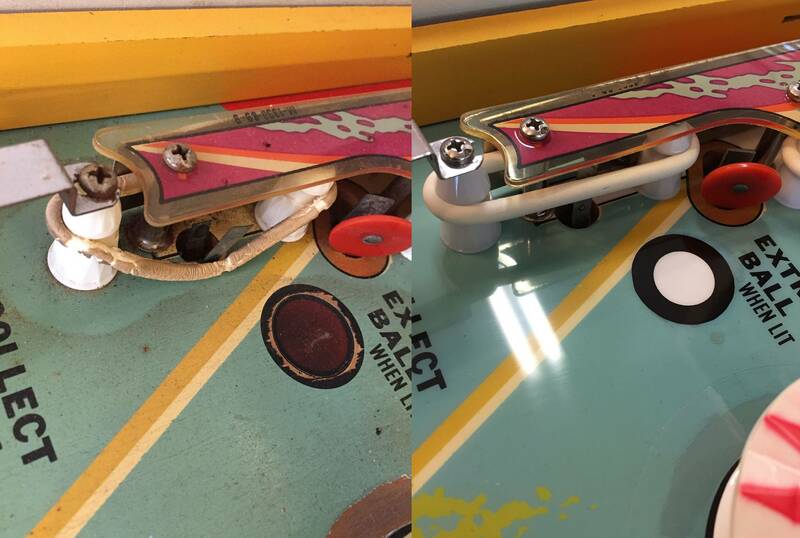 10 points switches and bumpers work fine with P2-10 point reel. P1-10000, P1-1000, P1-100 read 028 on the MM and P1-10 reads 1. So it's maybe not the EOS after all. I've checked it several time, it's clean and it opens and closes when it should with good contact. When I check the P1-10 point reel coil resistance, I get a 28 Ohms which is the same as the other reel coils. So it's maybe not a burnt coil. Sorry if you had already done this, but did you try ohming out (may be able to use the continuity beep) the EOS, Zero, and 9 Position switches while rotating the reel manually? To make sure they have low resistance when closed and that each is actually fully opening and closing at CORRECT times? It was probably already talked about between you and others, I just wanted to make sure it was covered. Obviously you can compair to another player to see they are opening/closing the same as well. But it may be good to check resistance just to make sure switches are making good clean low resistance contact.